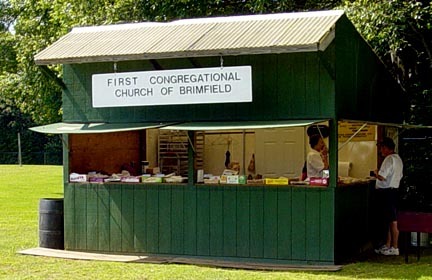 The Friday session at Brimfield features the opening of the final field—J&J’s—which is the site of the original Brimfield Flea Market, back more that 30 years ago. Until this year, the field opened at 6:00am, but now the opening is delayed 2 hours to 8:00 am, giving the Boston yuppies more time to get there and add to the opening rush. The downside is that it gives the dealers that are set up on the field two additional hours to cherry pick their neighbors—not a good thing for us ordinary buyers. I was in line at the back entrance at about 7:30am and enjoyed chatting with a couple of folks on either side—a fellow from upstate New York, who had built a large barn, and just wanted “to fill it with stuff, “and a collector from northern Maine who specialized in milk cans and bottles. When the field opened it turned out to be greatly reduced in size over that seen in May, with perhaps half of the number of dealers present. It didn’t take long to traverse the field, and until the very end I saw no tools that were reasonably priced—examples: badly chipped Stanley 97 plane for $375, no. 75 for $55, no. 60 ½ for $85, no. 18 for $87, etc. Finally, at the end of the last row I found a box of tools with one keeper—an older iron drill with rosewood top handle and a brass crank handle, marked by its maker. The price was much lower than you usually find these marked, and with the dealer’s discount it came down to reasonable. When the seller spotted the mark on the handle, he realized he’d made a mistake, but it was too late. Crossing to the other side of the row to start back slowly and carefully, I found a cane made of leather rings, but it featured a knob of Walrus ivory and pewter ferrule. It was a deal at the relatively low negotiated price. Meandering slowly down the row, going into every tent—glassware, textiles, wooden ware, etc, I found a small cache of English tools including a nifty brass plumb bob, two Rabone four-fold rules with arch joints and a Preston architects four-fold rule. They were more reasonably priced that you usually see these, and the dealer reluctantly came down a bit more. From this point on it was just picking up things one at a time—Disston No. 7 panel saw with a 14” blade, Stanley No. 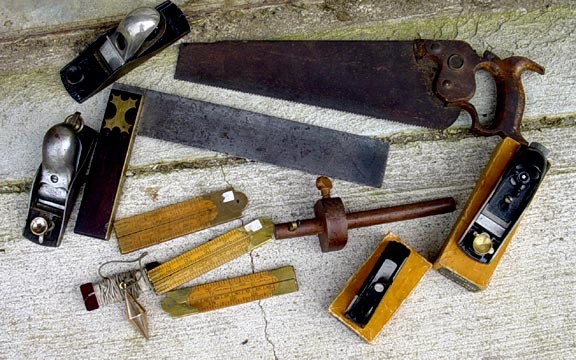 60 ½ IOB, three more Stanley block planes, and finally a dealer in wooden ware with a neat English slitting gage with a shapely brass wedge and a larger (12”) Tidgewell try square in quite decent condition. At this point it was time enjoy a slab of rhubarb pie from the Brimfield church ladies and unload the tools at the truck. With the tools safely in the truck I went back to a dealer who had a quite rare Stanley No. 90 Williams patent mortise gage. This had a nice eagle mark with the 1857 patent date. But it had some pitting problems and was missing the pins that fixed the mortise screw in place. He had it marked at the high end of book, and had come down to the low end. But on my return, refused to go lower. At this point I walked back across the street to Mays field that had been covered yesterday. I wanted look again at the A. Pope, Jr. grouse chromolithographs I had seen yesterday. At that point the dealer had come down from a $450 marked price to $200 for the pair. While meandering over to his tent, I picked up a nice Pike oilstone in the original box and a great three tier box with all sorts of small watchmakers tools in it. The dealer I was looking for was away from his stand, but his henchman remembered me. I told him that guy had offered the two prints for $200 yesterday (they were now marked at $300), and I came to offer him $175. The guy tried to reach the dealer on his cell phone but couldn’t. Then he turned to me and said that, hell, he’d take the guff, and I could have them for $160. It’s not often that you get something for a lower price than your offer! It made my day, and home I came. All in all, it was a pretty good Brimfield, and I’ll look forward to the September version.